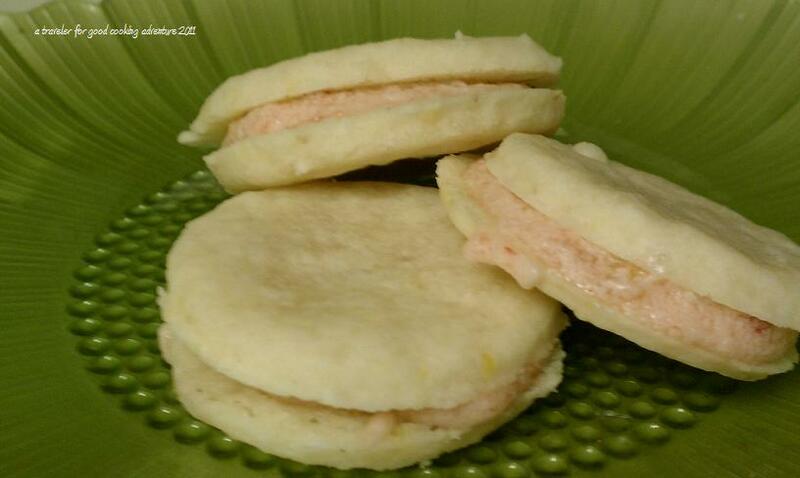 Another fantastic recipe from the Evil Shenanigans blog, Strawberry Filled Lemon Sandwich Cookies.﻿ After amazing weather last weekend that filled Denver's claim to fame of 300+ days of sunshine each year, we had the rest of the week. A little snow. A lot of rain. Not a whole lot of sunshine. Yesterday, after freezing in the rain at the Colorado Rockies game, it seemed like a great time to stay in the house and bake. I didn't have a small round cookie cutter or biscuit cutter, so I used a shot glass. It worked just fine. The strawberry frosting in the middle is amazing. Very simple and easy to make, but I can see using the frosting again and again. Conveniently it only required 2 tablespoons of strawberries, which worked out well because I had four berries left in the fridge.